Massive wildfires in eastern Arizona that have scorched 250,000 acres were probably started by Mexican drug traffickers or human smugglers, an Arizona sheriff told Fox News on Wednesday. 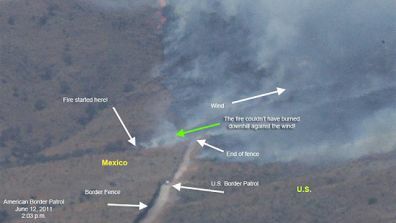 An aerial photograph purportedly taken on June 12 of the area by American Border Patrol, an independent organization that monitors the border, claims the blaze actually started in Mexico and traveled upwind into the United States. Dever said that was an “accurate picture” of what occurred. During a televised interview on Fox News, Cochise County Sheriff Larry Dever said the most recent blaze — the so-called Monument Fire — was “man-caused” and began about a week ago near Coronado National Forest, where the border fence ends. Dever said the 4,700-acre park had been closed for days prior to the start of the fire. Mexican Drug Smugglers to Blame for Arizona Wildfire? Federal authorities have said humans started the three major wildfires currently raging in Arizona, but it remains unclear whether illegal immigrants were involved. The second major blaze, the Wallow fire, is now 58 percent contained as of Wednesday after destroying at least 32 homes and burning nearly 828 square miles in eastern Arizona and western New Mexico since late May. The Horseshoe Two, meanwhile, is now 95 percent contained after scorching 348 square miles and 23 structures since May 8. Jeff Olson, a spokesman for the National Park Service, told FoxNews.com that the cause of the Monument Fire remains under investigation by National Park Service and U.S. Forest Service personnel. On Tuesday, following a barrage of criticism regarding those statements, McCain told NBC’s “Today” show he was “puzzled” by the barrage of criticism after his remarks. McCain said he was repeating information given to him during a recent briefing with federal officials. McCain’s statements angered Roberto Reveles, the founding president of the Phoenix-based Hispanic civil rights group Somos America. Politically correct fire stories…who is burning down our wildlands? The answer was perfect government evasion…human caused and under investigation. It is pretty much a given this time of year that any fire that starts around the borderlands is human caused. There is no lightning. And since the fires seem to almost always start on known human and drug smuggling trails…it is not like hunters or hikers started the fires. This is not hunting season and it is too hot for American hikers. The folks over in the Chiricahuas where the Horseshoe 2 fire is raging are convinced drug smugglers started that fire. And the 6 or so fires we’ve had around Nogales are probably 99% certain to have been caused by illegal aliens or drug smugglers. So why doesn’t the Forest Service admit that illegal aliens and drug smugglers are busy burning down the National Forest lands? Is it because President Obama’s claims everything is just wonderful on the border would look false if drug smugglers were starting fires so their drug mules could sneak thousands of pounds of marijuana into the country? Is it because Homeland Security Secretary Janet Napolitano would look bad if the truth were that illegal aliens that got across the border where there is no border security were burning the country down as they passed through?